Someone had asked me what the timeline might look like for the proposed Millbury slots parlor. Reading the agenda for tomorrow (Tuesday) night’s Board of Selectmen meeting, it appears as if they are ready to sign a host agreement with Rush Street Gaming. In that case, the date here would be July 23. After the host community agreement is executed, there needs to be a town-wide referendum no less than 60 days and no more than 90 days after the date the agreement is released. However, because things are happening so late for Millbury, I would anticipate it would be 60 days. The Gaming Commission website says this needs to happen by October, but since the Secretary of the Commonwealth needs ten days to certify the election, I’d say this needs to happen by late September at the latest. For any community (like Worcester) that declares itself a surrounding community that could be impacted, Rush Street needs to negotiate with them by October 2013. However, they do not need to come to a signed agreement — if they cannot agree, the Gaming Commission will decide on what they think will be fair. And remember, the Gaming Commission can change the host agreement that the voters voted for! For those of you in Millbury who are opposed, I wish you luck. We’ve got a lot of information on No Slots Worcester, but as you can probably tell, this is a process that is stacked against anyone — pro or con — who would like to have a public discussion that provides voters with real information and consists of a dialog with real answers. Rather, it’s a process where a town’s board of selectmen has an agenda item for their July 23 meeting to vote for a host community agreement, and then will have a public forum to discuss the proposal on August 12. In other words, there’s more opportunity for public input before a vote in the case of a dangerous dog or a no parking zone than for a slots parlor that could royally screw up traffic (even more than it is already) and add crime and addiction to a town and its surrounding communities. When the Worcester slots discussion was going on, there were a lot of folks who felt that voters should have the opportunity to vote on a host agreement. I could, perhaps, have agreed with that sentiment — if I hadn’t attended meetings in which plenty of voters were misinformed and misled by their elected officials, and told that their opinions didn’t matter. Wouldn’t it be something if the elected officials who have such respect for the electorate would also take voters’ input before host agreements are signed? Or, you know, let them see the host agreement they’re going to vote on before they vote on it? As has been reported elsewhere, Building 19 will be closing its store in Shrewsbury. When the decision was first announced, no dates were given, but on a recent visit, staff members mentioned that the store will close the first weekend of August. 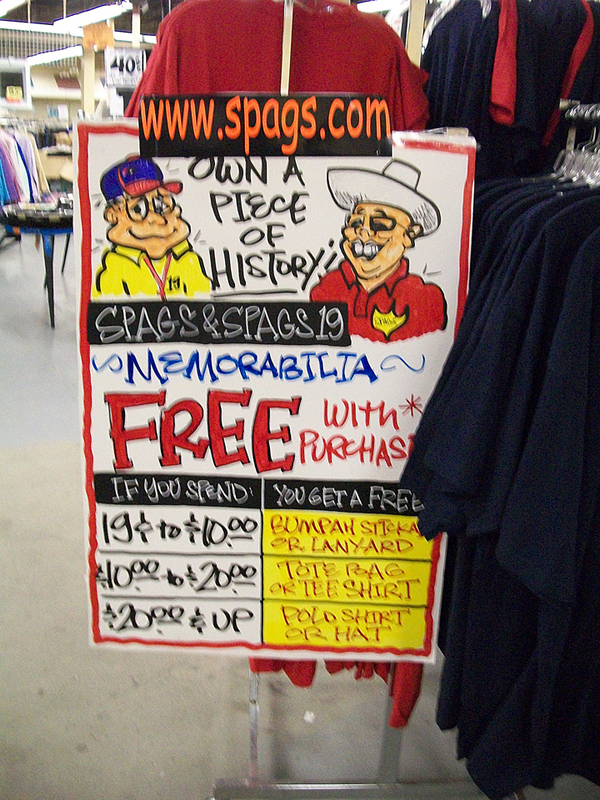 They have some promotional goods that date back to when the store was still called Spag’s, and even more stuff from a short-lived time when it was called Spag’s 19. 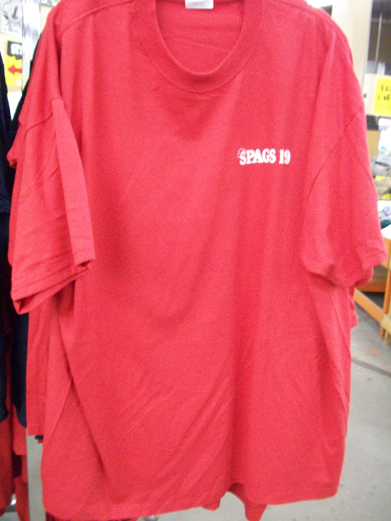 Many of the t-shirts say “Spag’s 19”, but a handful are just “Spag’s”. 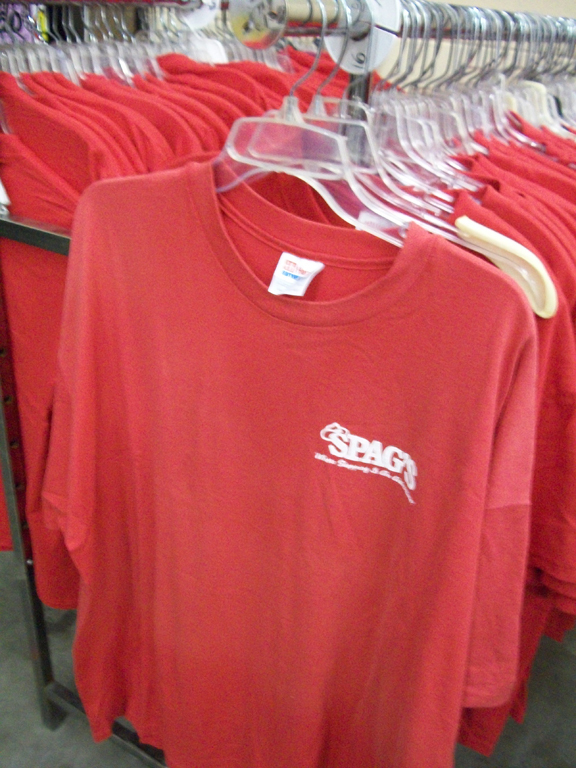 They’re available in all sizes, and in either red or dark blue. 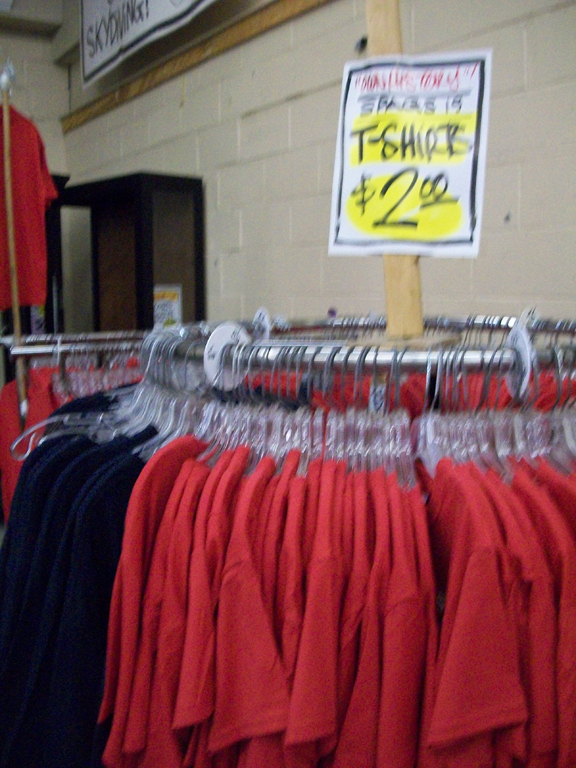 If you only wanted the shirt without making a $10 purchase, these can be bought for $2 each. The tote bags are of very high quality, made of a heavy-duty coated fabric like that used in tarps. 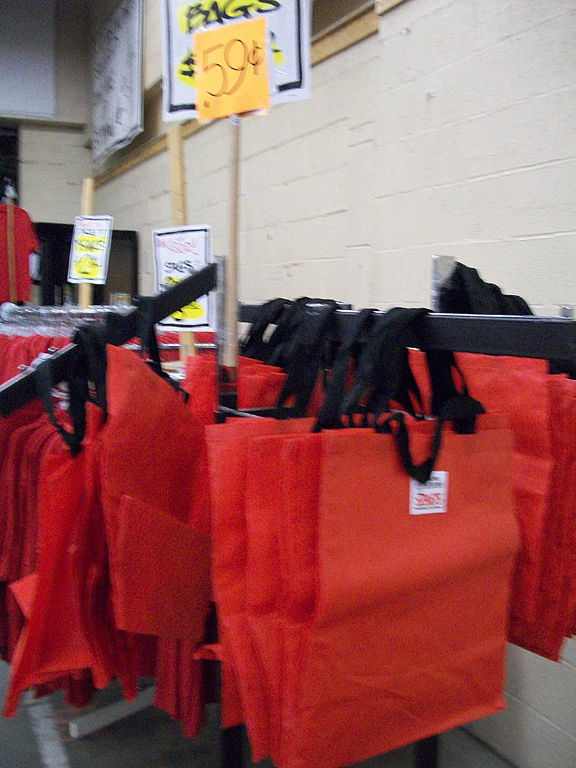 The tote bags can also be bought for 59 cents each — a great deal! They even have a little stitched-on tag that says “This bag for in store use only” and features the Spag’s logo. 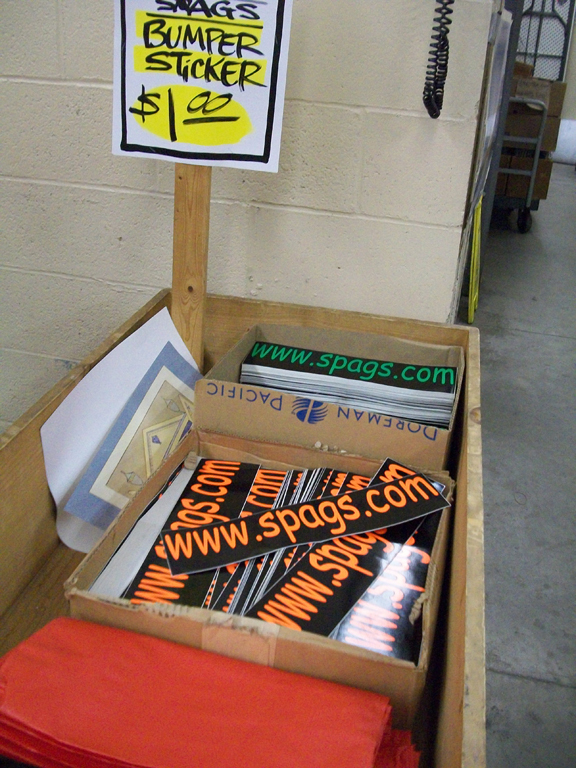 Perhaps these were used before Spag’s finally invested in shopping carts? 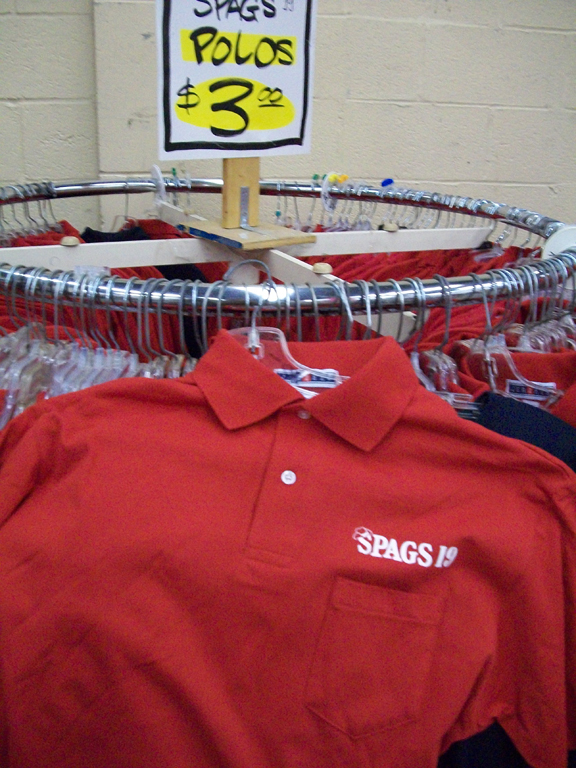 The caps & polo shirts can also be bought by themseleves for $3 each. 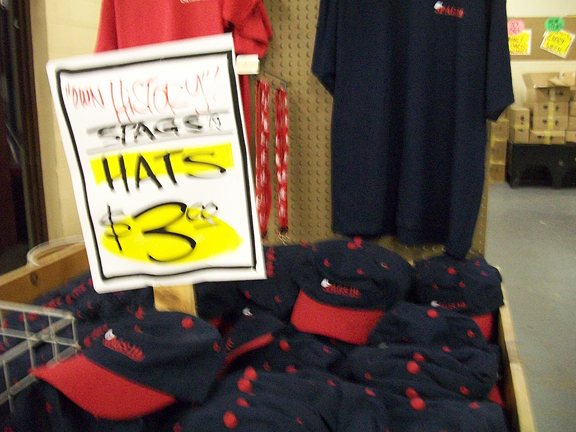 The polos are available in red or dark blue, and the caps are dark blue with a red visor. 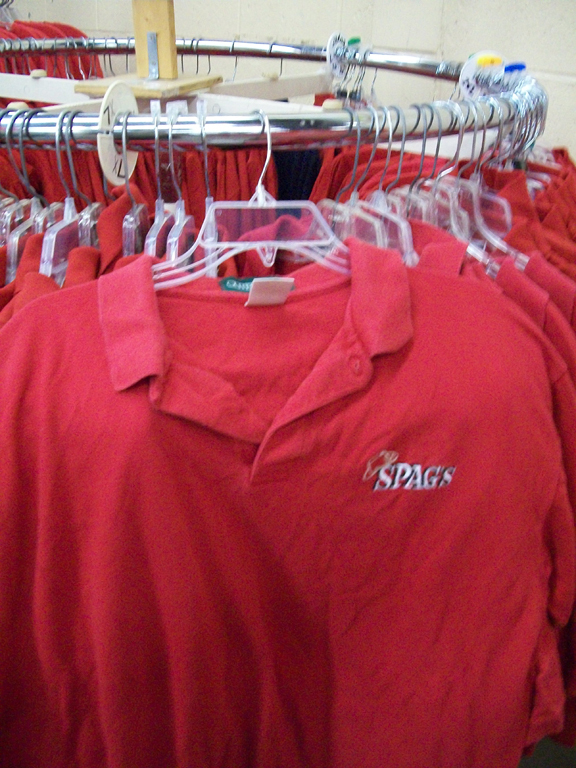 If grabbing a last-minute souvenir of Spag’s isn’t of any interest to you, stop by soon and see what other deals might be available. And do grab a cup of their free coffee — if you don’t like it, remember that one day you’ll be old and weak as well.